The Lake County Coroner?s office has yet to make a ruling on the manner of death for Fox Lake Police Lt. Gliniewicz. FOX LAKE, Ill. -- More than a week after Fox Lake Police Lt. Gliniewicz was found shot to death in a remote, industrial area, the Lake County Coroner's office has yet to make a ruling on the manner of death. Lake County Coroner Thomas Rudd told ABC7 Eyewitness News on Wednesday that Lt. Gliniewicz died from a "single, devastating wound" but declined to say where he was shot or how many times. Rudd would not say whether the bullet came from his own or another gun. He has not ruled out homicide, suicide or accidental death and said he needs findings from Lake County Major Crimes Task Force before making a determination. Gliniewicz initially radioed that he was pursuing three suspicious men, but investigators said they have found no surveillance video showing the suspects. On Monday, investigators said their most significant piece of evidence is DNA that was found at the crime scene. Authorities say it does not belong to Lt. Gliniewicz, but officials have yet to say whether they have found a match. A public visitation and memorial service will be held Monday for Lt. Joe Gliniewicz as the search for his killers continues. On Wednesday, one of Gliniewicz's sons spoke about his dad on a friend's online talk show. "He came off as kind of having a harder exterior with his military background and law enforcement background, but he would definitely want everyone to know that family is all you have," said D.J. 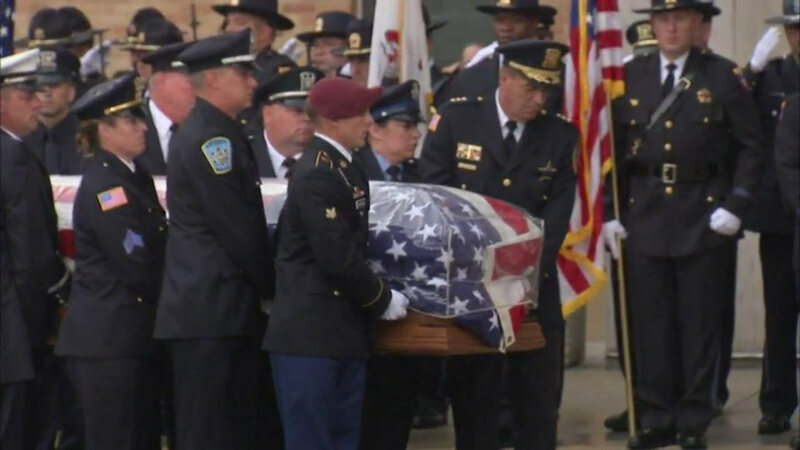 Gliniewicz, who served as a pallbearer on Monday at his father's funeral, which drew thousands of people. In McHenry, a community once again pitched in Wednesday night by hosting a screening of the film "Superman" to raise money for the Gliniewicz family. Another fundraiser will be held Friday night in Spring Grove.